UK government invests into technology education - is it enough? It’s been a blockbuster few months for news around digital skills. Here’s a wrap up of recent findings, announcements and initiatives. We applaud the government for working with academia and industry to increase digital skills – but we think there’s a blind spot here. The government needs to take the same approach with younger children – bringing in private partners that can help get kids become interested and confident as digital creators from very young ages. We want to be involved! We are already working with corporate sponsors like Barclays Bank to bring our programmes to students from all backgrounds, across the country. We want to be part of the strategy to support and encourage the next generation of engaged, inspired, empowered and diverse young innovators! The report added to the pressure on the government about how the lack of computing expertise will affect the future workforce. Lloyds bank reported that 11.5m people in the country do not have basic digital skills. Kathryn Parsons, founded of DeCoded and Chair of the DfE Advisory Board noted that the digital sector is creating jobs twice as fast as the rest of the economy. We need to improve the diversity of the professionals in the field. We heard important announcements over the last couple of weeks, by the Prime Minister in Davos, and by the Apprenticeship and Skills Minister, Anne Milton, at BETT. New ways to reach learners: The Government has invested £30million to test the use of artificial intelligence and edtech in online digital skills courses. Better access: the government has announced a national “full-fibre” network (sounds like a breakfast cereal! ), with 100 schools being the first to benefit. New qualifications: The government is creating a new qualification called the T Level, equal in esteem to the A levels, providing a path to skilled employment or higher ed technical study, and has allocation £500m per year to these. Specialist institutions: 10-15 new Institutes of Technology to focus on future skills. Ada, the National College for Digital Skills, in Tottenham is one, teaching digital skills in cooperation with industry, with targets that 50% of its students be female and 50% be from low-income backgrounds. “University learners (led by the Open University) – To boost graduate employability through a new industry standard targeted at degree level qualifications. IoC programmes will incorporate learning which solves real-world business problems and develops business, technical and interpersonal skills in equal measure. The digital workforce (led by Aston University) – To develop specialist skills training in areas of strategic importance. We think it is great that the government is getting serious about the digital divide – access to online resources and tech education – and digital skills – the quality of tech education, and the relevance to workplace skills, and the diversity of the participants. We applaud the government in bringing together the worlds of academia and industry to tackle these problems in practical and actionable ways. But there’s one big gap that we see in this programme: Almost all of it is geared towards adult or near-adult learners. There is an investment in teacher training, but why no private involvement in education for younger people? We haven’t found this addressed in anything that we have seen published about these initiatives in the last few weeks, and we’ve looked! Fire Tech believes that you can’t wait until students are studying for A or T levels, or even GCSEs to start developing interest, engagement, confidence, and skills – especially if your goal is to increase the diversity of our technical experts. Diversity is critical to innovation – bringing together different viewpoints to solve problems in new ways. And we strongly believe that if you want students – especially girls, minorities, and people from economically challenging circumstances – to take up these new programmes, we have to start MUCH earlier. 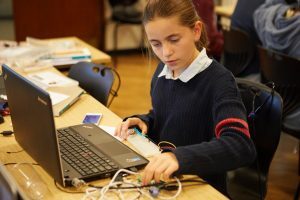 We know that our programmes are an excellent pathway to welcome those young people in and show them how empowering, creative, and fun tech skills are. We call on the government and the various bodies looking at these problems to recognise this and to include Fire Tech and groups like us at the table as they look for ways to ensure that the next generation has the tech skills, the soft skills, and the diversity that will be critical for the whole country to contribute to the growth of the economy and ultimately share in its rewards.